"Endless Love". "Up Where We Belong". "Save Your Love". 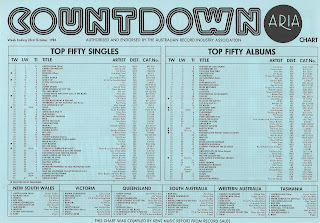 The '80s had already provided some monster ballad duets - and two more arrived on the ARIA top 50 this week in 1983. One of the ballads was performed by a pair of country superstars, while the other reunited two soul singers who'd previously collaborated on a live album in 1980. Both singles would be top 10 hits, one going all the way to the very top of the chart. 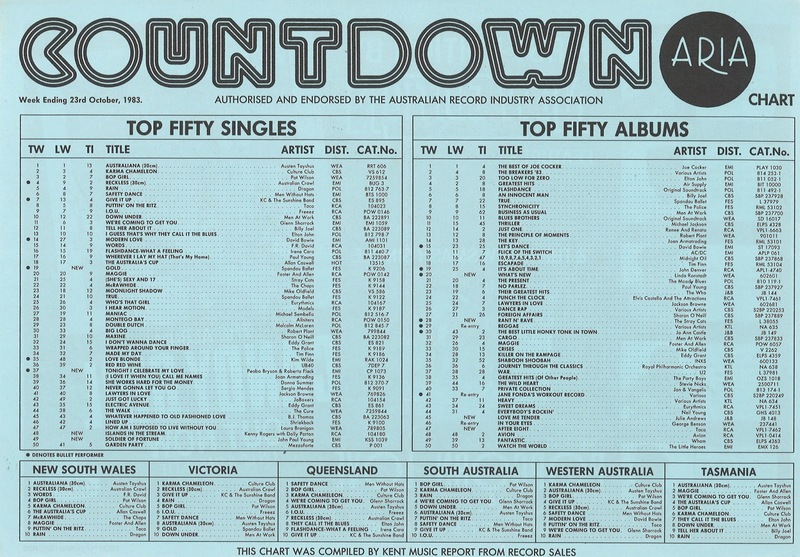 There was no change again at the top of the ARIA singles chart this week in 1983 as "Australiana" by Austen Tayshus spent an eighth week at number 1. The good news: it was the comedy record's final week as the nation's highest-selling single. He may have been marking his 25th anniversary as a recording artist with the Silver album, but as the chart position of this lead single shows, not so many joined in the celebration. This world music track by the South African band would later be re-recorded by singer Johnny Clegg's next group, Johnny Clegg & Savuka, in 1986 and included in Rain Man. Debut single "With Closed Eyes" had peaked inside the top 30 earlier in the year, but the Sydney synthpop band's follow-up was both less catchy and less successful. How different things would have been if Marvin Gaye had recorded "Islands In The Stream" as originally intended. The brothers Gibb had written the song as an R&B track but when Barry Gibb began production work on Kenny Rogers' Eyes That See In The Dark album, the song was restyled for him. And, since collaborating with a female vocalist had worked so well earlier in the year on Kenny and Sheena Easton's cover of "We've Got Tonight", "Islands In The Stream" was turned into a duet featuring fellow country superstar Dolly Parton - a pairing that was long overdue. With its instantly hummable chorus and sweet (but not sickly) sentiment, "Islands In The Stream" was a huge hit, reaching number 1 both here in Australia and on the mainstream Hot 100 in America. It would be the first of a number of collaborations between the singers, and not the last time the song (or, at least, its melody) would be a hit, with Pras Michel making use of the hook for his 1998 single "Ghetto Superstar (That Is What You Are)". By 1983, Roberta Flack already had two Australian chart-toppers ("The First Time Ever I Saw Your Face" and "Killing Me Softly With His Song") to her name, but it had been almost a decade since she'd seen the inside of the top 50. Peabo Bryson, meanwhile, had been releasing music since the mid-'70s without ever having landed a hit locally. Brought together again after 1980's Live & More, the two recorded a whole album of duets, Born To Love, which was kicked off by this Love Song Dedication favourite. Also known to Days Of Our Lives viewers as Bo and Hope's theme song (back when daytime soaps could afford to license original pop songs), "Tonight, I Celebrate My Love" was written by Gerry Goffin and Michael Masser - a pair who knew their way around a romantic tune. The songwriters were also responsible for "Theme From Mahogany (Do You Know Where You're Going To)", "Saving All My Love For You" and "Nothing's Gonna Change My Love For You". The super-sweet ballad would be Roberta's final top 50 appearance in Australia, while Peabo would manage three more hits - two of them Disney movie duets in the early '90s. Eclipsing those two love songs to be the week's highest new entry was the latest - and, for me, greatest - single by Spandau Ballet. We'd last heard from the British band with their own contribution to the list of classic '80s ballads, "True", but follow-up "Gold", while just as polished as its predecessor, was a dramatic and dynamic pop tune. Apparently conceived by the band's songwriter, Gary Kemp, as his spin on a Bond theme, "Gold" even came with a slick music video filmed in Spain that featured a young Sadie Frost spray-painted gold lying on a bed (a la Goldfinger). While not quite as big as "True", "Gold" provided Spandau Ballet with their second - and final - top 10 hit in Australia, and has been wheeled out ever since during Olympics coverage. Next week: two soundtrack singles enter the top 50 - one three years after the film it was taken from was in cinemas. Plus, a closer look at the albums chart. The two duets (Kenny & Dolly, Peabo & Roberta), and Spandau Ballet, are for me the classics of the new entries in this week. I agree that 'Gold' is Spandau Ballet's finest moment. 'Never Say Die (Give a Little Bit More)' is one of Cliff Richard's underrated singles. I find his synth-pop songs much more appealing than his ballads. The Expression got off to a good start with their first hit, but 'Decisions' was fairly average and probably charted accordingly. I've never understood the appeal of John Paul Young, and when I finally heard 'Soldier Of Fortune' about ten years ago on a Countdown episode, I still didn't. I quite like Never Say Die as well, and others from that era like Give A Little Bit More, The Only Way Out and Carrie that you don't hear about so much now. 'Soldier of Fortune' sounds like it should have been on a soundtrack album. I always associate the joke about Dolly Parton singing 'Islands In the Stream' to her chest, when she takes a bubble bath, with the song. I never watch the Olympics, or any sport on TV (or elsewhere) for that matter, so never knew 'Gold' was used for those. Quite an excellent song, with a striking video to boot. I love Johnny Clegg's music with Juluka and with Savuka. Discovered him much later though in 2010 on CD and was unaware of him at all at the time. Ibhola Lethu (Our Football Team), Osiyeza (The Crossing) and Asimbonanga are my favourite ones by him. Gold is arresting. I like Spandau Ballet, but really the only songs of theirs that I love are the ballads True and Through The Barricades. Gary Kemp is a good songwriter though. I like Soldier Of Fortune, and clearly remember it from the radio at the time. It was JPY's last time on the charts with original material. It had an interesting yidaki or didgeridoo type sound on it, which was rare at the time. Kenny & Dolly were played to death right through summer 83-84 on the radio. Only years later did I discover that the Bee Gees wrote and produced it.